Our Praesidium has experienced many challenges at Benedictine College that we’ve had to address, find ways of addressing, or are currently addressing. The handbook requires that the meeting should be in a place where all can sit comfortably, with proper seating and a regulated temperature to help keep the spirit of order at the meeting. Our meeting place used to be located in the Moritz Board Room on the upper level of the Student Union (now called the St. John Paul II Student Center). It was chosen because it had a nice long board table, which makes it perfect for setting up the Legion altar. It was centrally located on campus, which made it great for anyone who was traveling across campus to attend. It was also near the ministry office, where we kept our supplies. However, we faced a multitude of challenges with the room: constant interruptions from students or faculty walking by, getting it unlocked at the right times, scheduling conflicts with other groups, very few people knowing where it was located, or not being able to unlock the ministry closet to get our supplies. We tried another area in the student union but had the same problems. When Br. Benedict held the first meeting for the Spring 2015 semester, the same problems cropped up, so he looked for a new place to have the meeting. He chose the Abbey’s guest house lounge as a temporary solution, but after two meetings, it became clear that it was a very good place. The room is in a place on campus that doesn’t have a lot of traffic but is still easy to find. Because the meeting occurs during the evening, no one else is using it and it is very quiet, which makes the meeting flow very well. There is also a room off to the side in which we can store our supplies and altar between meetings without having to worry about not being able to access it. Getting and retaining members has been a sometimes difficult and frustrating part of running our Legion. Below we’ll outline some of our difficulties. Because we are a college praesidium, keeping a steady membership base is difficult. Our members are guaranteed to be members of the Legion at most for four years. Considering the fact that an officer position itself lasts for three years, this really isn’t a large amount of time to have our members before they are gone. This requires a constant effort at recruiting and forming our Legionaries in a way that is time effective and long lasting. College is a busy time and we have often lost members in the past due to scheduling conflicts or a growing schoolwork obligation as the years progress toward graduation. It’s an unavoidable problem that we still continue to address. Because officer positions last for three years, a freshman could feasibly take up the obligation of being president and finish at the beginning of his or her senior year, if other obligations do not force them to step down prematurely. This gives an opportunity to have an experienced officer who is able to train their successor but it can also mean that someone holds on to this position until the time that they graduate, taking all of their experience with them. An idea worth considering for this problem is having a vote for a “coadjutor” officer who is voted for a certain period ahead of time (a semester, for example) who can learn from the active officer and will take up the duties when the other lays them down. At BC, fliers play a huge role in a campus group or club’s success. They are one of the best ways to keep others posted about meeting times and places. We have had several fliers through the years. Below are a couple. BC posters have to be approved by the SGA. Due to the cost of ink, we also choose to print ours in black and white. We make the images by finding a clipart image online (such as searching miraculous medal clipart) and then playing with the settings to fade it and make it sit behind the text. This makes for a highly attractive image without overwhelming the text. 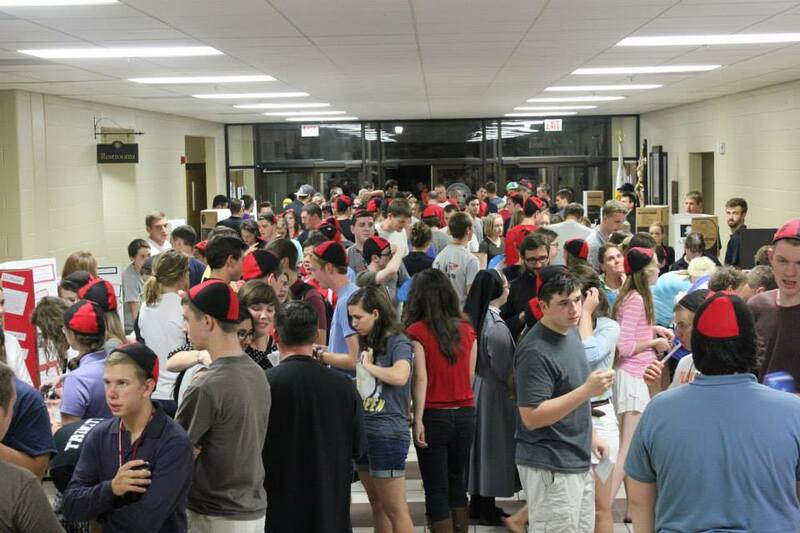 At Benedictine College, St. Martin’s Campus Ministry holds an event at the beginning of every semester called the Ministry Fair. The major groups on campus are each given a table for a display in the John Paul II Student Center. This gives all the various groups an easy way to recruit for their ministries and a chance for the students to see what different things are offered on campus. The ministry is a great opportunity to reach out to new students for the Legion and gives an opportunity to be seen and heard in a more definite way. One of our most important target groups for membership in the Legion of Mary is freshman, though we do not exclude other classmen. Freshman are particularly good with recruiting. Freshman have a pretty free schedule when they arrive at college. They are just beginning to encounter student groups rarely have a prior affiliation, which means that we have a greater chance of success. Because of the time that they enter the Legion, they are the most likely to last the longest as members before graduation. The Legion seeks to reach them through what is commonly known at BC as a “Dorm-Storm.” This involves, in the short time of a couple of hours, knocking on all the doors of the freshman dorms and inviting those we meet to come to our meeting. We hand out a small slip of paper with the information for where to find the meeting and then we’re off to the next dorm room.